In a recent work on pulsar radiation theory, Dr. Rai Yuen, an associate researcher from the pulsar research group at the Xinjiang Astronomical Observatory (XAO), proposed a new model that have brought a step closer to better understanding of pulsar emission visibility. The work has been published in the <Monthly Notices of the Royal Astronomical Society>. Shortly after the first pulsar was discovered in 1967, astronomers noticed that individual pulses from pulsars exhibit systematic drift at a constant rate progressively through the pulse window in successive pulses. The phenomenon repeats when the subpulses return to their initial positions after several pulsar rotation periods. Recent observations from some pulsars reveal drifting subpulses with unusual evolutionary features and complicated characteristics (middle and rightmost images in the figure). Subpulses from few of these pulsars show variations in their separations through the pulse window (rightmost image) implying dynamical nature of the magnetospheres. This is in clear contradiction to traditional steady state descriptions at the fundamental level. Using computer simulations, researcher shows that pulsar visible emission is restricted to specific locations that change as the pulsar rotates. Furthermore, results show that some pulsars may even consist of multiple radiation configurations and that the pulsars can change between different configurations. This is in consistent with observations. It is widely believed that studies of drifting subpulses can give insights into the electro dynamic processes in the regions where the radio emission is produced and to explore the nature of radio pulsars. Through investigations of drifting subpulses that exhibit time-dependent features, researcher has made modifications to the traditional models. The resulting new model provides more precise descriptions for the phenomenon. Rich varieties of drifting subpulses. The leftmost image shows drifting subpulses as described in traditional models. 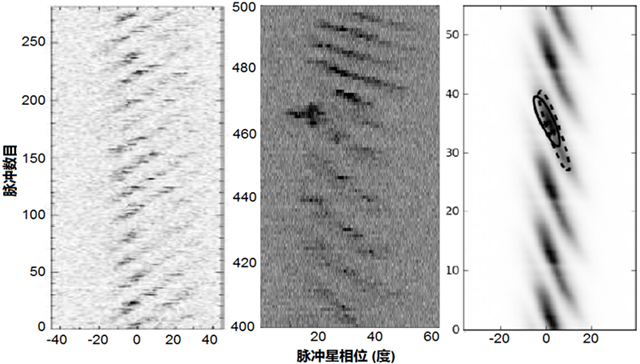 Unexpected additional properties that show sudden change in subpulse drift patterns are shown in the middle image, where the separation between subpulses are different before and after around pulse number 470. Curved subpulse drift-bands are shown in the rightmost image. The pulsar are PSRs J1231-47 at 1.4 GHz (leftmost, Ord et al.2001), B0031-07 (middle, Smits et al. 2005) and B0809+74 (rightmost, Hassall et al. 2013) both at 328 MHz.